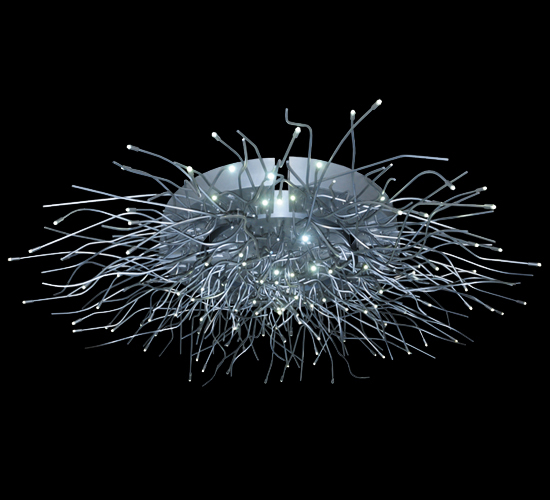 Description: Combining a unique grand scale modern design with energy efficient technology, the Medusa Custom LED Chandelier creates a profound design statement. Custom designed and crafted with 120 Bayonette mounted LED lights and luxurious hardware in a Brushed Aluminum. The chandelier is 28 inches tall and over 10 feet in diameter. Handcrafted in Yorkville, New York. This ceiling fixture is offered in custom sizes, styles and finishes, as well as dimmable energy efficient lamping options. UL and cUL listed for damp and dry locations.